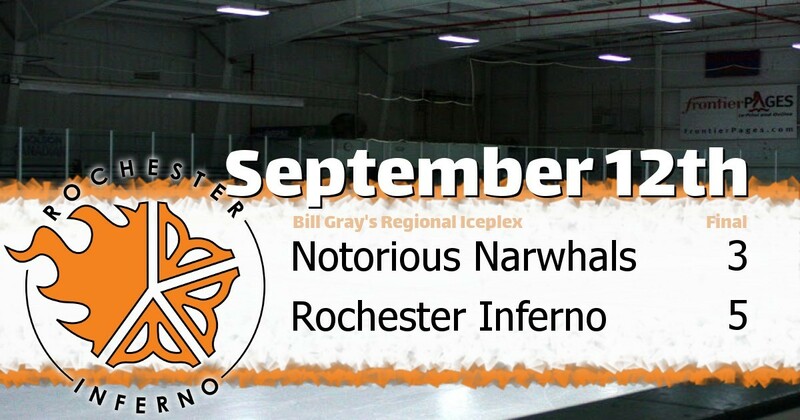 BILL GRAY'S REGIONAL ICEPLEX, September 12, 2018 - The visiting Notorious Narwhals took on the Rochester Inferno (D) in a matchup on Wednesday. The Inferno defeated the Narwhals 5 to 3 at Bill Gray's Regional Iceplex. This was the 12th match-up between these two teams, and their last matchup was won by the Notorious Narwhals 6-1. The Notorious Narwhals lead the series 7-5-0. The Rochester Inferno had 7 players that made the scorecard. Michael Atseff had 3 goals (3 points). Chris Linford had 2 goals (2 points). Meg Murphy had 2 assists (2 points). Steve Sydorowicz had 2 assists (2 points). Mike Flannery had 1 assist. Tim Daly had 1 assist. Dave Morgan was whistled for 2 penalty minutes. Michael Atseff was awarded the hot dog.